Okay, that would be my first post shorter than its title, but I’m tempted to leave it at that. Don’t make church growth your goal. Make your goal preaching Christ, making disciples, putting people to God’s work with the help of His Holy Spirit. 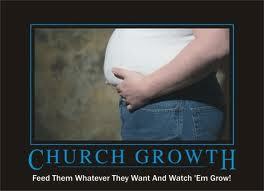 The church that results from that will grow, if the seed finds receptive soil and God gives the growth. Keep watering. Plant more seed; the Word — you know. Don’t worry about uplifting worship times, awesome praise teams or incredibly gifted worship bands or dynamic speakers or cool videos or special programs or targeted ministries or awesome marketing or a big, sprawling building or sufficient parking or offering seeker services or traditional services or progressive services. Some of that may come, but fend it off as long as you can. Tell them about Jesus. Show them Jesus. Win them to Jesus. Demonstrate to them how they are visiting Him in jail; how they are clothing His nakedness and feeding His hunger. When they have worked side by side with each other and with the Spirit, they will want to gather in praise, as often and as devotedly as possible. People who can see the work of God – the work He is doing through them; in partnership with them – when they see that work in the lives of others … they’ll see it in their own lives too and you won’t be able to shut them up when it comes time for worship. Or any other time. It will well up from within them like a spring of living water. Just stand back and thank God when it happens and you get caught in the spray. You may not be able to limit them to just meeting on Sundays to worship together. They might just open their hearts and their homes and their dinner tables and their earnings to each other. They might sell their possessions and give to those who have need until no one among them has need anymore. I know all this sounds too good to be true. I know it sounds like a pipe dream. I know it sounds all but impossible. But it also sounds a lot like the last few verses of Acts 2, and well into Acts 3 and 4. And it also sounds like what Jesus said about nothing being impossible with God (Matthew 19:26; Mark 10:27; Luke 18:27). I like your emphasis on the fact that God is the One who gives the increase. Amen! Well Said….we are supposed to be building church in the hearts of men/women…carving them out to be living stones, via biblical discipleship – investing time and everything in people,so they might catch the true vision of jesus,not necessarily always in the buildings and programms, but rather in relationships and teams for them to find their own giftings and calling, with the guidence of God…His kingdom is within …..I loved this article and have forwarded it to others too. Great Stuff! Thank you!